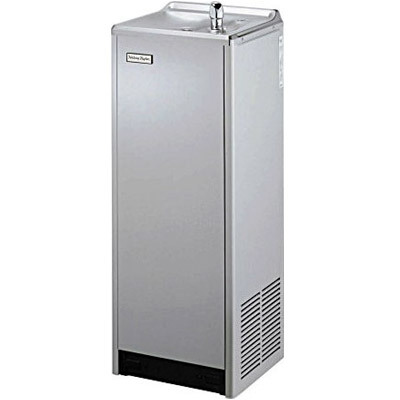 The Halsey Taylor SCWT14A-VR-Q Water Cooler is an electric, refrigerated free-standing unit. Delivers 13.5 GPH of 50°F water at 90°F ambient and 80°F inlet water. Fountain has stainless steel basin with removable drain strainer. Bubbler is chrome plated, two-stream, mound-building type. Separate valve and automatic stream regulator can be mounted within cabinet. Refrigeration system employs high efficiency, positive start compressor using R134A, non-pressurized tank with totally encapsulated insulation and be controlled by positive sensing thermostat. Unit is certified to NSF/ANSI 61 and meets requirements of the Safe Drinking Water Act. Unit complies with ARI Standard 1010. Vandal-resistant projector is one-piece, chrome-plated. Unit has integral hood guard design to prevent contamination from other users, airborne deposits and tampering.